A team from the ETH in Zurich and the University College in Dublin has been able to demonstrate a 3D printing approach to create bacteria-derived functional materials by combining the natural diverse metabolism of bacteria with the shape design freedom of additive manufacturing. 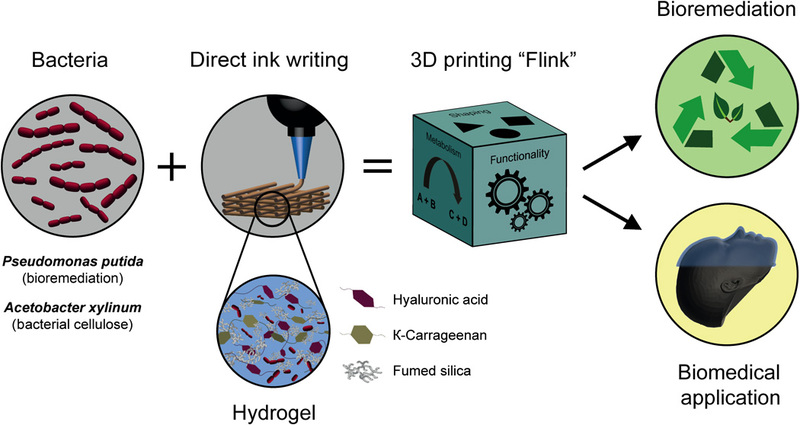 They have developed a biocompatible hydrogel with optimized rheological properties that allows for the immobilization of bacteria into 3D-printed architectures at a high accuracy. They have demonstrated two applications: degrading environmental toxins, and making cellulose, which can be used as scaffolds for skin replacements and coatings for biomedical devices that help protect patients against organ rejection. 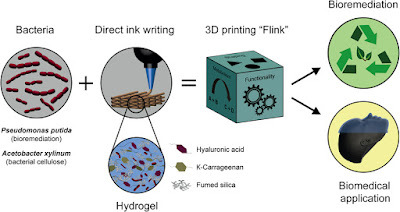 Immobilization of Pseudomonas putida, a known phenol degrader, when printed allows to degrade phenol into biomass, showing the potential of the 3D bacteria printing platform for biotechnological applications. Immobilization of Acetobacter xylinum in a predesigned 3D matrix enables the in situ formation of bacterial cellulose scaffolds on nonplanar surfaces, relevant for personalized biomedical applications.